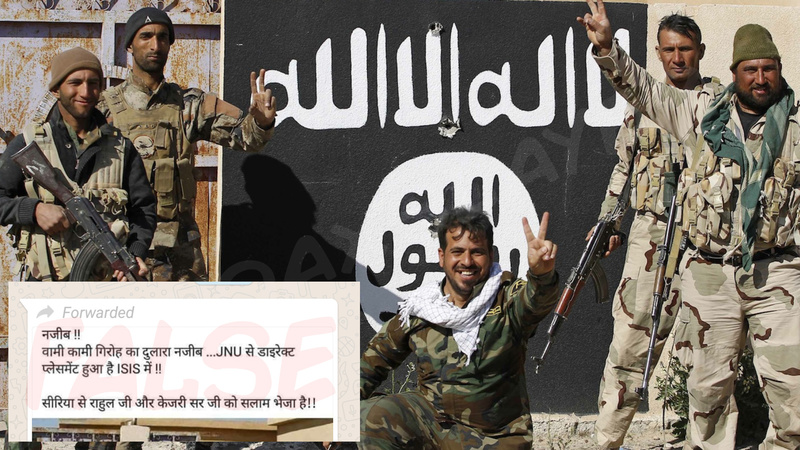 A photo of ISIS is viral in which one is claimed as the missing JNU student Najeeb Ahmad. अरे अपना नजीब…JNU वाला नजीब…आज़ादी गैंग वाला नजीब !! वामी कामी गिरोह का दुलारा नजीब …JNU से डाइरेक्ट प्लेसमेंट हुआ है ISIS में !! पहचाना इसे ? ?अरे अपना नजीब…JNU वाला नजीब…आज़ादी गैंग वाला नजीब ! !वामी कामी गिरोह का दुलारा नजीब …JNU से डाइरेक्ट प्लेसमेंट हुआ है ISIS में ! !सीरिया से राहुल जी और केजरी सर जी को सलाम भेजा है!! Najeeb Ahmad, a student pursuing MSc in Biotechnology in JNU, has been missing since October 2016. While his mother had been crying and asking government to find his whereabouts, there had been lots of speculations and theories floating around on Social Media since then. Following PM’s Chowkidar campaign, she asked the same question again. This was followed by the above viral posts as answers that Najeeb has not gone missing but has joined ISIS and the photo is the proof. लेकिन अब चोंकाने वाली तस्वीर आयी है।वही नजीब अहमद अब ISIS का आंतकवादी बन चुका है।निश्चय ही मोदी और भारत सरकार ने भेजा होगा उसे?? ← A misleading letter is viral warning about Social Media posts. How a photo can be misused. Modi Ji did greet Gandhi Ji along with Abe. Congress IT cell head posts a clipped video to mislead all. September 19, 2018 Hoax Slayer Comments Off on Congress IT cell head posts a clipped video to mislead all. Will Sri @KapilSibal fight for #RapistRamRahim in Supreme court ?